Anyway that is enough for this evening. We will be back for more live text commentary tomorrow as AC Milan, and Fernando Torres, travel to Parma. Its been a pleasure. Cheers for your interaction, and your company and see you tomorrow. Atletico meanwhile travel to Olympiakos as the Champions League group stages begin on Tuesday full of confidence, Diego Simeone's men just keep rolling on. Real will have to get themselves together for their next match - a Champions League home match against Basel. Their start to the campaign has been embarrassing enough but defeat for the European champions on Tuesday and people really would start to talk. Andrew: Diego Simeone, master tactician. The new 'Special One'. Christian Cordina: Paying £60m for James Rodriquez and selling Di Maria for £50m is an example of fixing something which wasn't broken. Tom Fio: Real losing means one more point than Man Utd from 3 games. Not great for a team with James, Kroos and co.
DeathApeDisco: Robinho, Beckham... Bale? Madrid players bulking up and losing a yard of pace. Gareth is too muscular at the moment. Notice anyone missing from the La Liga table? No, it's not an error. Real are 12th in the table with two defeats from three matches. They are Manchester Unitedesque in their current slump. Javier Hernandez will be feeling right at home. A classic away performance by Atletico Madrid. They soaked up Real attack after Real attack before hitting them with a sucker punch. Diego Simeone really is a master tactician. Gary Lineker on Twitter: They can trap Simeone behind glass but they can't contain his Atletico Madrid team. Simeone spent the game behind glass in one of the boxes at the Bernabeu after being banned from the touchline. Incredible. 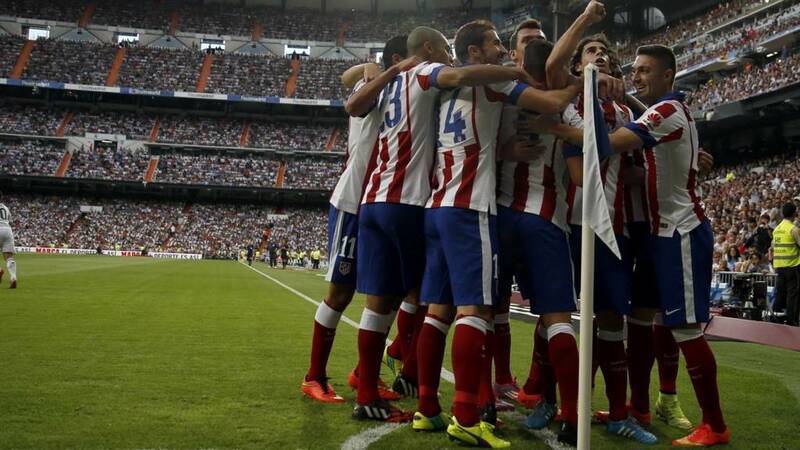 The first time ever that Atletico have achieved back-to-back wins against Real in La Liga. The balance of power has well and truly shifted. Goal kick for Atletico and that should be that. Darren Worsnop: Simeone a wonderful manager. Loses star player every year but somehow keep producing quality sides. DeathApeDisco: James Rodriguez - the South American Tom Cleverley? A minimum of two minutes stoppage time is signalled. Nothing is the answer. Far too easy for goalkeeper Miguel Moya. At the other end Antoine Griezmann finds the side netting after a quick break. Atletico just won't be broken down. Their defending has been outstanding as Real continue to be frustrated. Free kick 40 yards out for the hosts and the defenders are forward. What can they do with this? Real's Luka Modric is rightly booked for a foul on Mario Suarez. Atletico looking in control now as we enter the last five minutes. Toni Kroos fires over the bar for Real from 30 yards. Desperate stuff from the hosts as they look to avoid a second straight home La Liga defeat to their Madrid rivals. Atletico boss Diego Simeone is trying to wave his side forward from the stands. He may be banned from the touchline but he is still well involved - or at least he wants to be. Shohidur Rahman: Real Madrid just not the same side as last season. So unbalanced. Missing Alonso and Di Maria badly. at hand THE brand: Chicharito to rescue Real. Christian Cordina: Atleti have something Real will never buy - teamwork. Fantastic goal! Chaos inside Atletico's penalty area but somehow the ball is scrambled clear. The goal has sparked Real back into life and it is all hands on deck for the visitors now. We have a frantic last 10 minutes to look forward to. Would you believe it? Having been dominated for most of the match, champions Atletico are back ahead. Antoine Griezmann does well down the right and his pull back is nonchalantly swept home by Arda Turan from inside the area after a clever step over by Raul Garcia. This is better from Atletico. An inviting cross from Juanfran and Arda Turan is just beaten to the ball by Alvaro Arbeloa. Chance for Atletico and substitute Arda Turan is inches away from giving his side the lead. The Turk cuts inside and attempts to curl the ball into the opposite corner. There is no bend on the ball though as it arrows past the post. Gareth Bale is replace by Isco as Real look for someone to produce that moment of magic. There is a real lull at the Bernabeu as Atletico stay solid and Real struggle to make a breakthrough. Abut to enter the last 20 minutes and there is no doubt the visitors will be the happier. Martyn Hearne: I would take Di Maria's guile, skill, pace and vision over James Rodriquez every time! There's a reason Ronaldo didn't want him to go! Ihsan Elahi: Bale might have changed the scenario if on ground today. So he couldn't break into a struggling Manchester United side, can Javier Hernandez make an impact at the European champions? The United loanee is on for his Real debut in place of Karim Benzema. There is also a change for Atletico as £24m man Antoine Griezmann is on for Raul Garcia. Diego Godin loops a header over the bar as Atletico finally enjoy some of the ball in Real's half. Perhaps a sign that the visitors are growing in belief? Turkey midfielder Arda Turan is on for Atletico skipper Gabi, who appears to be limping. Shay: Surely Isco is better than James Rodriquez. Bring him on Carlo. Or maybe Khedira. Barcelona will be loving life if this stays the same. At the moment, Barca top La Liga with nine points from nine, while Real will be in seventh on four points and Atletico a point ahead in second. Atletico have hardly had possession of the ball this half as they seem happy to sit deep with all of their players behind the ball. 'Break us down' they are saying to Real Madrid, who so far don't have the answer. Just as I say that, Gabi sits on the naughty step after a late lunge of James Rodriguez. Deserved booking. A strike from about 40 yards from Pepe and unsurprisingly the ball flies over, well over. Atletico are trying to strangle the life out of this match. Carlos Tevez has now scored 20 goals in his 36 Serie A appearances. There are 15 minutes gone in the Serie A match between Juventus and Udinese and former Manchester United and Manchester City striker Carlos Tevez has just given the former the lead with a shot from inside the box after being set up by Stephan Lichtsteiner. Surely Atletico won't wait too long before introducing big-money summer signing Antoine Griezmann to proceedings? They need a spark. Back underway at the Bernabeu. Cristiano Ronaldo has scored in five of his last six meetings with Atletico in La Liga (eight goals in total). Despicable D: Is Gareth Bale unfit or has he really lost some of his explosive pace due to bulking up? Real will be disappointed they are not ahead after dominating their visitors. Atletico have been gritty, they have been brave, but surely if they continue defending so deep, Real will take advantage? Atletico have been very disappointing as an attacking force for the majority of the half. A weak scuff wide from Koke sums up their offensive efforts. Real continue to pile on the pressure. This time Pepe's header across goal just evades Cristiano Ronaldo. OptaJose: 11 - 11 of Atleti's last 14 league goals have been headers, with nine of the last 11 coming from set pieces. Even closer from Karim Benzema as his downward header is parried away by Miguel Moya. It is all Real Madrid. Better from Karim Benzema after good approach play by Cristiano Ronaldo and Gareth Bale works the ball to him on the left. The Frenchman cuts inside two defenders before drilling the ball wide from 18 yards. Atletico could do with half time here. Karim Benzema. You have to score from there. The Real Madrid striker has just the goalkeeper to beat after a lightening quick break from Real sees Cristiano Ronaldo square the ball to him inside the penalty area. But Benzema's first touch is shocking - and that is being kind - as Miguel Moya gratefully gathers. Real have their tails up now. James Rodriguez hasn't had the best of starts to life in Madrid since his summer transfer but he is looking lively this evening. Atletico need to take the sting out of this. Shohidur Rahman: I love Ronaldo but that's a clear dive for me. I agree it was a very close call. Just about enough contact for me though. Never in doubt was it? Cristiano Ronaldo calmly slots home the spot kick as parity is restored. It is soft but probably just about enough contact for a penalty kick. Cristiano Ronaldo shows quick feet inside the area and is nicked by Guilherme Siqueira. The Atletico man is booked. Goalkeeper Miguel Moya keeps Atletico ahead with a fine diving save to his left. Gareth Bale was the free-kick taker as he curled the ball over the wall but not quite far enough away from Moya. Frustration for the hosts. James Rodriguez is booked for dissent after being flattened just outside the visitors' box. Play was waved on as Karim Benzema curls a shot just wide. What a start for the champions. Atletico pride themselves on being dangerous from set pieces and that is why. Koke's left-wing corner finds Tiago Mendes unmarked at the near post and he flicks home from close range with his head. Almost the first chance of the match as Koke's cross from the left nearly finds Atletico striker Mario Mandzukic. Great defending from Pepe, who lunges to clear before the striker can pounce. Michael Phillips: That Real Madrid line up is just an amazing pool of word class players. Nothing but a win for them today! Real are already complaining about Atletico's approach after Raul García's knee goes into the back of Fabio Coentrao. Whistles from the crowd and players around the referee, but there didn't seem a lot in it. Real Madrid are patiently keeping possession early on as Atletico look happy to let them have it and sit deep. This could become the pattern as the visitors rely on the counter. Here we go then. Barcelona have already made it three wins from three in La Liga, how will their two greatest title rivals respond? One of Europe's biggest matches? I think so. The teams are on their way out at a packed Bernabeu. What a sight greets the players as Real fans hold up cards showing off their colours. This is some atmosphere. Does Carlo Ancelotti have any fears about Atletico's robust style? It would seem not. "Atletico aren't a violent side," he said. "They have their own style of play that is intense. Their style has given them a lot of rewards. Two different styles face off tomorrow and we will see who is right". "This is football and it's not a game for little girls; it is for men." Both teams will have half an eye on their midweek Champions League tests. Champions Real entertain Basel on Tuesday night, while Atletico travel to Olympiakos the same night. Odds on a repeat of last season's all-Madrid final? Pretty long you would have to think. While there is bound to be no shortage of explosive action on the field this evening, it may be a little different on the touchline than previous Madrid derbies. Atletico boss Diego Simeone will be forced to watch from the stands after being given an eight-match touchline ban for his behaviour in the second leg of the Spanish Super Cup against Real. Mind you, with assistant coach German Burgos stepping in during the suspension, it probably won't be any less quiet from the bench. OptaJose: 1 - Carlo Ancelotti has only won one of three meetings with Atletico in the Bernabeu (D1 L1); 3-0 in last season's Copa del Rey. Challenge. OptaJose: 7 - Atletico are unbeaten in 7 Madrid derbies in La Liga (W5 D2), their best ever unbeaten run against fellow capital-based sides. Spirit. Goalkeeper Iker Casillas has just passed his 15-year anniversary at Real. He has won three Champions Leagues, two Intercontinentals, two European Supercups, five leagues, two Copa del Rey titles and four Spanish Supercups. Also, having played 683 matches, he sits behind only Raul (741) and Manuel Sanchis (710) in the appearance records. Real Madrid on Twitter: We will hold a minute of silence in the memory of former player Fernando Zunzunegui who passed away recently. What a World Cup Real Madrid's £71m summer signing James Rodriguez had. The Colombian won the Golden Boot with six goals in five matches in Brazil as they reached the quarter-finals. The fourth most expensive transfer of all time after those of new team-mates Gareth Bale and Cristiano Ronaldo and Barcelona's Luis Suarez, the 23-year-old is yet to get off the mark for Real. Will tonight be his time? There were a few puzzled looks as Real moved for Manchester United's out-of-favour striker Javier Hernandez on loan on transfer deadline day. He will be hoping to make his debut from the substitutes bench today and where would you prefer to be at the moment? On the bench for Real or on the bench for United? No real question is there? John McEnerney: AM haven't replaced the likes of Costa & TC well enough to compete like last season maybe domestically but not the CL‏. Andrew Priestley: Real Madrid's attack is frighteningly good, their defence on the other hand are frighteningly poor for a top, top team. Both Atletico and Real will be slightly disappointed with their starts to the season after dropping points already. shock 4-2 defeat to Real Sociedad last time out, while Atletico opened their title defence with a goalless draw at Rayo Vallecano. Their stuttering starts has allowed Barcelona seize the early initiative in La Liga - making this evening's Madrid derby even more crucial for both. Real Madrid on Twitter: Some of the fans outside the Bernabeu. a 3-1 win over Freiburg. Bayern Munich were also victorious with a comfortable 2-0 win at home to Stuttgart, with goals from Mario Gotze and Franck Ribery. Manchester City next for Bayern and Arsenal for Dortmund in the Champions League. Barcelona defeated a stubborn Athletic Bilbao 2-0 to maintain their 100% start to La Liga season. Barca are looking ominous at this early stage and both Madrid sides will be wary of letting them get away from them. While it may be an evening for enjoying some tapas and sangria, don't think we will only be stationed in Espana this evening. Former England and Chelsea defender Ashley Cole's Roma are leading 1-0 at Empoli in Serie A, while defending champions Juventus entertain Udinese later. We will keep you across all the action. Twitter: Ready for the game. So what do you think? Who does have the best strike force in Europe and why? Let us know your thoughts via the usual channels. Tweet #bbceurofooty or text 81111 (UK users only). Real Madrid coach Carlo Ancelotti has invested heavily this summer to further improve the attacking prowess of his side, with the big-money signings of Toni Kroos and James Rodriguez. Mexico's Javier Hernandez has also signed on loan from Manchester United. Add that to the likes of Portugal's Cristiano Ronaldo and Wales' Gareth Bale and can there be a more potent attack in Europe? I guess Barcelona and Luis Suarez, Lionel Messi and Neymar might argue there is. Don't rule out Atletico though. They have already beaten Real to the Spanish Supercup this season and haven't been quiet in the transfer market themselves. At £24m France winger Antoine Griezmann became their second most expensive player ever after Radamel Falcao when he joined from Real Sociedad. Mario Mandzukic cost in the region of £17m from Bayern Munich, while Jan Oblak, Raúl Jiménez, Guilherme Siqueira, Correa, Miguel Ángel Moyà, and Jesús Gómez have also arrived for significant sums of money. Having spent somewhere close to £100m this summer, Atletico aren't too far behind Real's total transfer spend. Some believe their shift in transfer policy has made them even stronger. Will Atletico count the Costa? Atletico boss Diego Simeone has already downplayed his side's chances of defending their league title for the first time in more than 60 years. And, on first glance it is easy to see why. Financially, Spain's traditional big two are on a different planet with Atletico having to battle against a circa 400m euro budget deficit. Also, almost inevitably, there has been a player exodus from the Vicente Calderon. Of the 11 players who started Atletico's final league game of last season, five have left, including goalkeeper Thibaut Courtois and top scorer Diego Costa. Meanwhile Barca and Real have brought in Luis Suárez and James Rodríguez respectively, for upwards of £75m apiece. Can Simeone & co scale another mountain? Good evening and welcome to our latest European football live text offering and what a humdinger of a match we have for you. For too long, the Madrid derby was a virtual non event as Real dominated their city neighbours. Not any more though with Atletico arriving at the Bernebeu this evening the kings of La Liga. Anyone feel Real have got a point to prove? Atletico's incredible past 12 months has seen them break Barcelona and Real Madrid's 10-year duopoly by winning the La Liga title for the first time since 1996. It also brought them a Champions League final and - from just a few weeks ago - the Spanish Supercup. Not that they had it all their own way though as bitter rivals Real stole the final bragging rights last season with Champions League victory. Cast your mind back to 28 September last year. It was Gareth Bale's home debut after signing for Real Madrid for a then world record £85m fee as Atletico travelled to the Bernabeu looking for a first win over their city rivals for 24 league matches. Diego Simeone's men were playing the role of party poopers as they buried a 14-year-old curse. The party for Los Rojiblancos has been going on almost ever since.